Fresh air, nature, and a whole lot of family bonding. 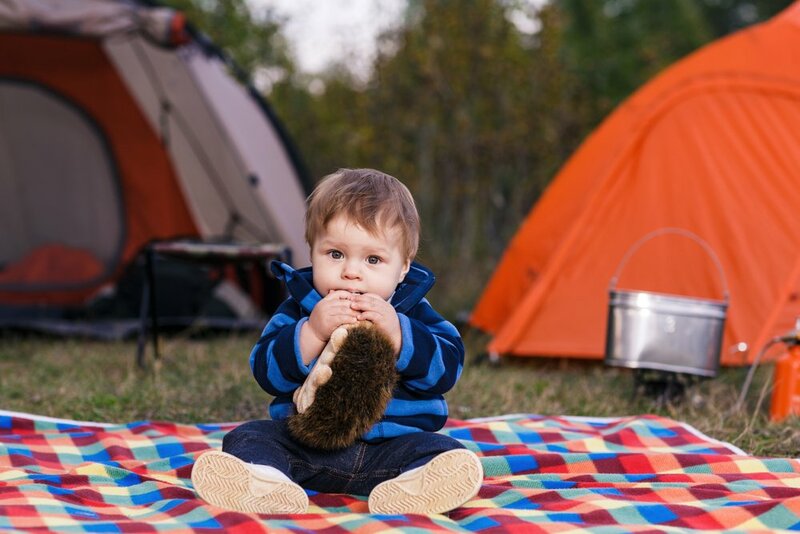 A camping trip can be a rewarding experience for the whole family. However, taking your little one will mean you must plan ahead in order to have a successful and enjoyable trip. The location of the trip will determine the preparations you must make to ensure a pleasurable experience. Going camping in the woods will be wildly different from a trip up a mountain or a campsite near the beach. Regardless of the place, body temperature regulation in babies isn’t fully developed which is why your little one will need protection from the weather. You need to make sure your child isn’t too warm or too cold, and the best way to do this is with the appropriate layers of clothing. Babies can lose body heat very quickly, possibly 4 times faster than an adult can. Inversely, they can also experience overheating if you’re not careful. While packing, make sure to consider an appropriate hat, sunglasses if needed, and enough baby sunscreen and/or bug spray. It is not recommended to expose a baby younger than 6 months to direct sunlight. If older than 6 months, use sunscreen, but avoid peak hours, usually from 10 a.m to 4 p.m.
Sleeping can be a bit tricky during a camping trip, and possibly a major pitfall. If your kid has a comfort object such as a pacifier, make sure to keep it at reach. Going out several days? What happens if there is an accident and the bedding gets wet? Whatever the circumstance, plan your baby’s sleep requirements ahead of time and take the same precautions you would at home. The American Academy of Pediatrics recommends a firm sleep surface with no loose objects or loose blankets or bedding. What about feedings? Breastfeeding is the most convenient way to feed during a camping trip. Not only is it practical but preferable, since breastmilk will help fight infections and pathogens. Exclusive breastfeeding eliminates the need for sterilizers, bottles, and formula; nevertheless, this may not be possible or a viable option. If you need to pack said items, pack them separately in an accessible place during the car ride. Make sure to pack enough water, solid food, if needed, and to take more with you than necessary in case you need extras. Before going on the adventure, make sure to be up to date on all vaccines and wait a few days after vaccinations before going on your trip. A basic baby first aid kit is a necessity at home and even a more crucial one on a trip. Make sure to pack all the medicines and vitamins your infant may need and don’t forget to contemplate possible allergic reactions, asthma, fever, and any ailments your child may be prone to. Since this is your first trip, start with an overnight trip close to home. If possible, really overdo it with the packing: take extra clothes, diapers, food, toys, etc. When in doubt, pack it! Are babies who reach milestones early academically gifted later?